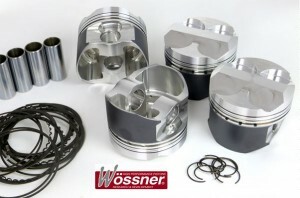 Wössner pistons feature a unique PTFE coating on the skirts and a grade of 4032 Alloy (T6) which allows the engine builder to run a closer piston to bore tolerance then he might do on another make of piston. This helps remove the slapping noise during cold start, common place among engines running forged pistons due to larger then OE bore clearances. The crowns of the pistons are also polished to better resist detonation on a high performance engine. Polishing allows a more even spread of heat inside the chamber which will help prevent “hot spots” on piston crowns. Price includes all piston rings, circlips and gudgeon pins. 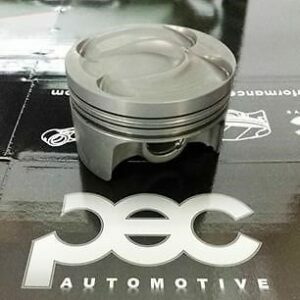 After years of market research and actual product testing in conjunction with several well respect ed tuning companies, PEC at last launches a new breed of piston on to the European market. One of the things missing from the European aftermarket industry is a mass produced piston range that is engineered for the end users needs. Using the last decades of experience, we here at PEC are confident we have developed a range of pistons to suit almost every possible need. Why are PEC pistons so good? Well the answer is simple. Most mass market piston manufacturers will rely on online data and a single customer’s feedback when creating a piston, often without taking into account things like the average age of an engine, the correct cylinder head chamber volume, the correct gasket thickness. All this can be calculated, but it is never 100% correct….. until now. If you’re buying a PEC piston kit, you’re also buying into our research and development, as well as countless hours of experience and customer feedback on achieving the optimum level of performance from the pistons in your engine.